What do you get when you combine chocolate chip cookie dough and pie? Chocolate Chip Cookie Pie, of course! Chocolate chip cookie pie is a delicious, rich, and decadent dessert. It's perfect when the occasion calls for something a little fancier than plain chocolate chip cookies. This Chocolate Chip Pie is adapted from the wonderful little Kathleen's Bake Shop Cookbook: The Best Recipes from Southhampton's Favorite Bakery for Homestyle Cookies, Cakes, Pies, Muffins, and Breads by Kathleen King, proprietress of the famous Tate's Bake Shop in Southampton, NY. In the book, Kathleen explains that she made her first Chocolate Chip Cookie Pie before she opened her shop in 1980. 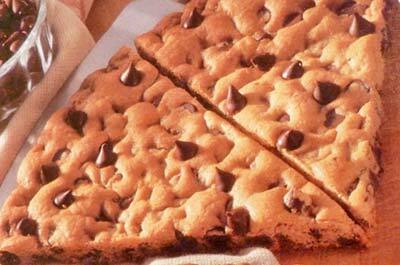 Chocolate Chip Cookie Pie is a cross between a brownie, a chocolate chip cookie and fudge and impossible to resist. It is so quick and easy to prepare too. This is one of those deliciously easy dessert recipes you will turn to again and again. In a large bowl, beat the eggs and vanilla. Add the flour and sugars and mix well. Add the butter and stir until combined. Bake for 1 hour, or until the center is firm. Remove from the oven and place the pie on a wire rack to cool. Serve small wedges with vanilla or coffee ice cream or whipped cream. Makes one 9-inch Chocolate Chip Pie. Preheat oven to 350F degrees. Line a 12-inch pizza pan with foil. In a large mixing bowl, beat butter, brown sugar and granulated sugar until creamy. Add egg and vanill and beat well. Gradually add the dry flour mixture to the butter mixture, blending well. Pat the chocolate chip cookie dough mixture into prepared pizza pan to within 3/4 inch from edge. Bake for 15 to 18 minutes, or until lightly browned. Remove from oven and allow cookie pie to sit on pan for 5 minutes before transferring to wire rack to cool completely. Cut into small wedges and serve warm with vanilla cream or plain. Prepare dough as directed above in Chocolate Chip Cookie Pie Recipe. Shape cookie dough into 2 rolls, each 1 1/2 inches in diameter. Wrap each roll individually in platic wrap. Refrigerate for several hours or until firm enough to slice. Heat oven to 350F degrees. Remove plastic wrap from rolls and with sharp knife, cut rolls into 1/4-inch thick slices. Place slices about 3 inches apart on ungreased cookie sheet. Bake for 8 to 10 minutes or until lightly browned. Cool cookies slightly on pan before transferring to wire racks to cool completely. This recipe makes about 2 1/2 dozen Chocolate Chip Refrigerator Cookies. Prepare dough as directed above in Chocolate Chip Cookie Pie Recipe. Heat oven to 350F degrees. Drop dough by 1/4 teaspoonfuls about 1 1/2 inches apart onto ungreased cookie sheet. Bake for 5 to 7 minutes or just until set. Cool cookies slightly on sheet then transfer to wire racks to cool completely. This recipe makes about 18 dozen (3/4-inch) Miniature Chocolate Chip Cookies.